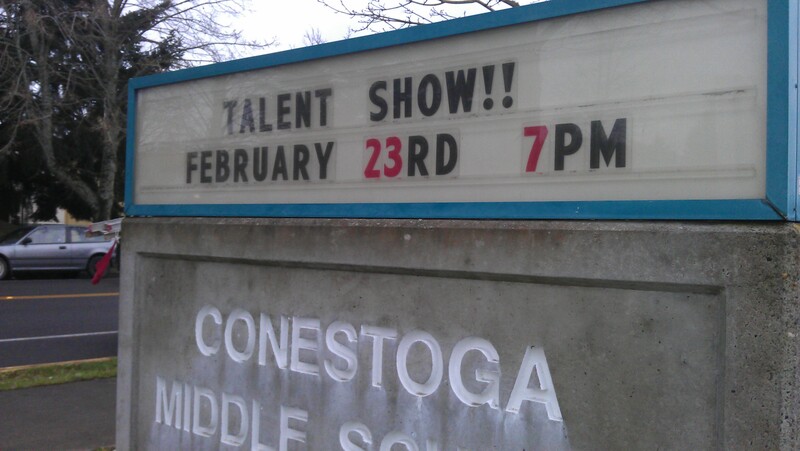 This morning, as I posted the information about an upcoming talent show on the reader board at my daughter’s school, I got cheers. The secretary with which I have been coordinating these messages was driving into the school parking lot and cheered me on with a wave and a couple toots on the horn. Even though I was just posting a note on the reader board, she was honking as though I had completed a virtuoso performance. The irony wasn’t lost on me. It takes absolutely no talent to put letters up on a reader board. It just takes a little persistence to keep updating the board every week and a little desire to save a school employee some time. A lot of life is like that. Talent helps, but those who truly excel have learned desire and persistence. Keyword – ‘learned’. Those skills come with practice. And a great way to practice is to give your time again and again. Along the way, you’ll learn how to succeed because you’re not doing it for a paycheck, you’re doing it for your community, your neighbors, your family, your friends and yourself. Talent helps. But those who excel rely on desire and persistence. With no talent at all, I updated the reader board at my daughter’s school. This entry was posted in In the community and tagged Children, desire, Giving Our Time, giving time, mary kay ash, middle school, persistence, talent show. Bookmark the permalink.